According to the eat seasonably website cauliflower is at it’s best in April. Honestly, I thought they’d got their months mixed up, but no, there it is and I just happen to have 3 things to do with a cauliflower. I know this dish is deeply unfashionable at the moment, but it’s one that my mum used to make, so it’s a very comforting dish. I made it last week, using about half a cauliflower head, for my two girls and they loved it. I would make a dish like this maybe once or twice a month and serve with vegetables and half a baked potato. It’s a simple, cheap midweek meal, on a day when your kids have had a lunch that includes high quality protein (meat, fish, eggs, pulses or lentils). 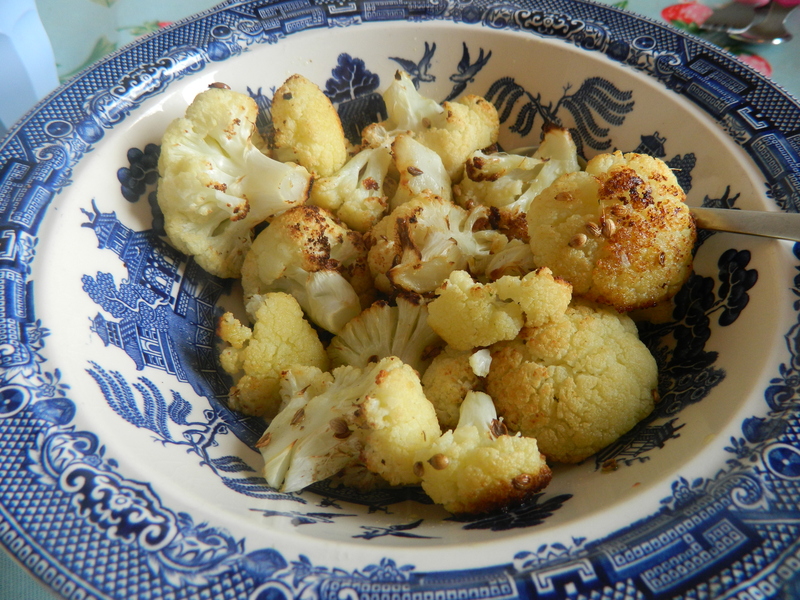 Break the cauliflower into florets and steam until slightly soft – about 5-7 minutes. Arrange in a shallow ovenproof dish. Now make the roux sauce which is the base for the cheese sauce. 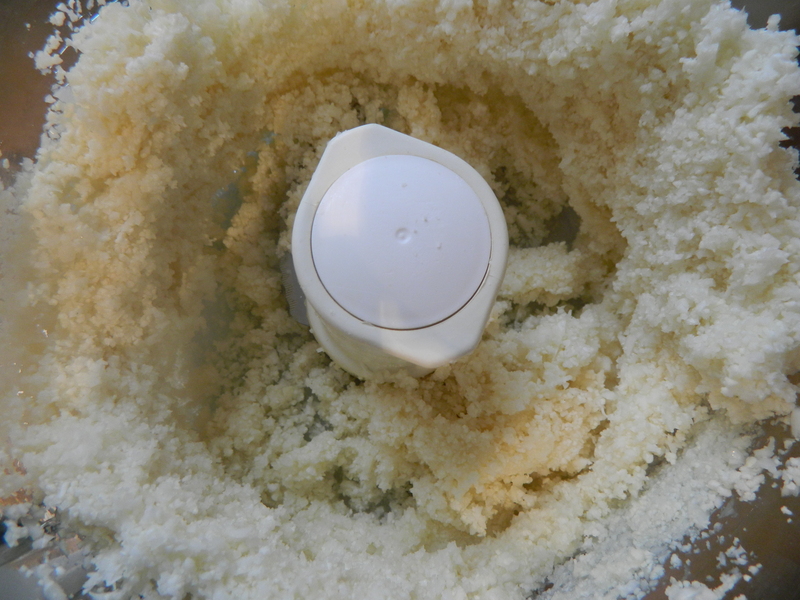 Melt the butter in a heavy bottomed pan. When it’s all melted add the flour and mix together fully to make a paste. Keep stirring for a few minutes to allow the flour to cook through. Pour the milk a little at a time, stirring each time to incorporate it fully into the paste before adding more milk. Once you’ve poured all the milk in it should be a slightly thick, smooth texture. If you need to add a little more milk then do. It should start to bubble a little, when it does remove from heat. Grate the nutmeg into the sauce and add the teaspoon of mustard and mix well then add the grated cheese. 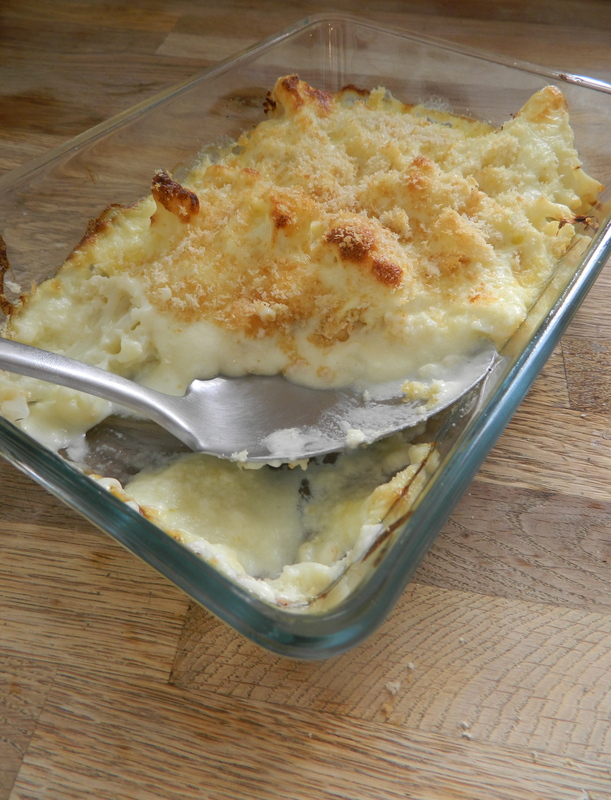 Arrange the cauliflower in one layer in a shallow oven proof dish. Pour over sauce evenly over the cauliflower. Grill on a medium heat for about 10 minutes until bubbling and the breadcrumbs are golden brown and crispy. I’d hesitate calling this a recipe but people have different levels of cooking skills so am going to include instructions. Pound the coriander seeds in a pestle and mortar. Add the coriander seeds and olive oil to the cauliflower and mix thoroughly. Put on a baking tray, big enough so that all the florets are touching the base of the tray. My friend shared a photo of her gluten free pizza – where the base is made with cauliflower on Facebook, and it looked so great I was inspired to try it. I am playing catch up on this one as there are lots of versions of this recipe out there. People on paleo diets and those with gluten sensitivity or celiac disease have to be creative with their cooking and this is a great example of just how creative they can be. The recipe my friend used is from the rather lovely The Green Kitchen Stories Blog. Here’s what the processed cauliflower looks like before you bind it together with eggs, ground almonds into a dough for your pizza base. You can have it as it is as cauliflower rice. I had some left over passata in the fridge so I fried a garlic clove in olive oil and added the passata and some fresh oregano leaves and reduced it down a little. 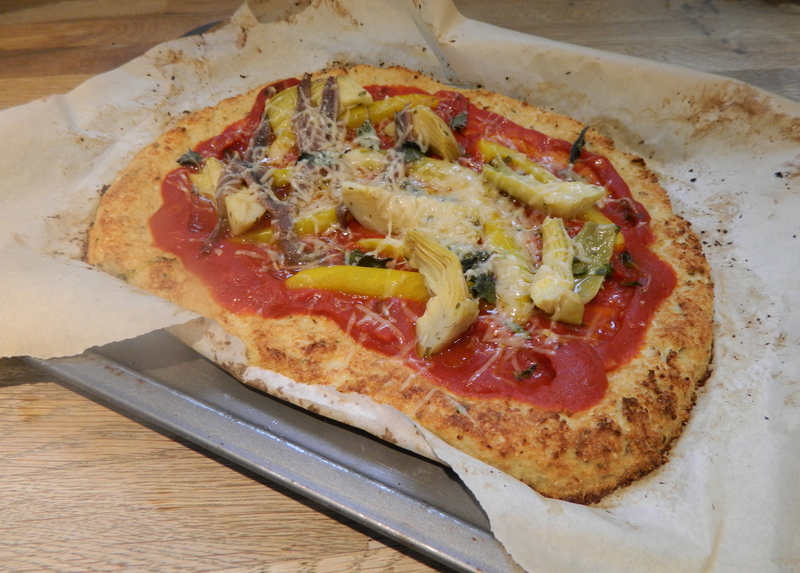 I only used toppings that I had in the fridge: yellow pepper, artichoke hearts and fresh oregano and parmesan (oh and some anchovies – for the grown ups). My 16 month old wasn’t keen – I think the texture of the base wasn’t what she expected. I loved it, as did my husband, so I am going to make it again this week. I will keep giving her a little to try when we have it, so hopefully over time she’ll get used to it. Am not sure whether I will convince my 7 year old but she’s always open to trying new food so we shall see. 80g of cauliflower contributes a portion of veg to your recommended intake. I know the government’s guidance is to eat at least 5 portions of fruit and veg a day, but really positive effects of eating fruit and especially veg begin when people eat at least 7 portions a day. The positive effects are even more marked when they eat 10 plus portions a day. This was highlighted by the latest research that was published few weeks ago which adds to to the evidence to support higher intakes. The Daily Telegraph report on the findings is really clear and concise and is worth a read. An 80g portion of cauliflower will provide an adult female with 4 times her recommended vitamin B6 intake for the day, a fifth of her recommended folate intake, even boiled (which depletes vitamin C) it contains just over half recommended vitamin C intake. So that’s what I’m doing with cauliflowers at the moment. What are you doing with yours?